*** ASK US ABOUT OUR FLY STAY DRIVE PACKAGE **** MY17 MMAYNKK40HH007885. For over 30 years the Mitsubishi Triton has helped Australians get the hard jobs done. Engineered to deliver power performance 5 star safety towing and technology this is one tough ute that is as easy to handle as a passenger car. The Exceed and GLS 4x4 Double Cabs are the ultimate sports trucks with a standard sports bar 17” alloy wheels and LED Daytime Running Lamps. Mitsubishi Triton Double Cabs offer a spacious cabin with rear seat leg room and a reclined seatback angle providing plenty of leg shoulder and head room in the front and back to easily carry five adults. Triton diesel models are powered by a super-responsive 2.4L DOHC MIVEC 16 valve common rail intercooled diesel engine. An aluminium cylinder block and strong yet lightweight materials reduce weight and with a compression ratio of 15.5:1 it is amongst the quietest and most efficient diesel engines. The impressive MIVEC common rail direct injection turbo diesel engine will exceed your expectations delivering power torque and exceptional fuel efficiency. Whether towing or load carrying you can be confident that your Triton will get the hard jobs done. With the option of Full-time 4WD High and Low Range 4WD with centre diff lock and selectable 2WD the Super Select 4WD II system on the Mitsubishi Triton GLS and Exceed will give you more control in bad weather or on difficult surfaces. Buy from this independent family owned dealership and we will deliver what we promise. We have been selling cars for decades throughout metro and regional WA. If you are looking for a good deal value for money and a team that talks straight - then we are your team. Free shipping and personalised delivery in Perth by a member of our team. Great Value - Great Service are not just words to us. The Exceed and GLS 4x4 Double Cabs are the ultimate sports trucks with a standard sports bar 17” alloy wheels and LED Daytime Running Lamps. 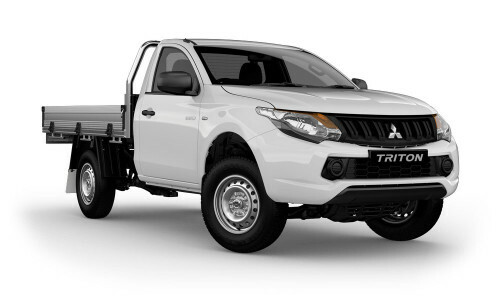 Mitsubishi Triton Double Cabs offer a spacious cabin with rear seat leg room and a reclined seatback angle providing plenty of leg shoulder and head room in the front and back to easily carry five adults. Triton diesel models are powered by a super-responsive 2.4L DOHC MIVEC 16 valve common rail intercooled diesel engine. An aluminium cylinder block and strong yet lightweight materials reduce weight and with a compression ratio of 15.5:1 it is amongst the quietest and most efficient diesel engines. The impressive MIVEC common rail direct injection turbo diesel engine will exceed your expectations delivering power torque and exceptional fuel efficiency. Whether towing or load carrying you can be confident that your Triton will get the hard jobs done. With the option of Full-time 4WD High and Low Range 4WD with centre diff lock and selectable 2WD the Super Select 4WD II system on the Mitsubishi Triton GLS and Exceed will give you more control in bad weather or on difficult surfaces. Buy from this independent family owned dealership and we will deliver what we promise. We have been selling cars for decades throughout metro and regional WA. If you are looking for a good deal value for money and a team that talks straight - then we are your team. Free shipping and personalised delivery in Perth by a member of our team. Great Value - Great Service are not just words to us. I'm interested in a Demo 2017 Mitsubishi M GLX Single Cab Chassis 2WD Petrol (stock #1200963).